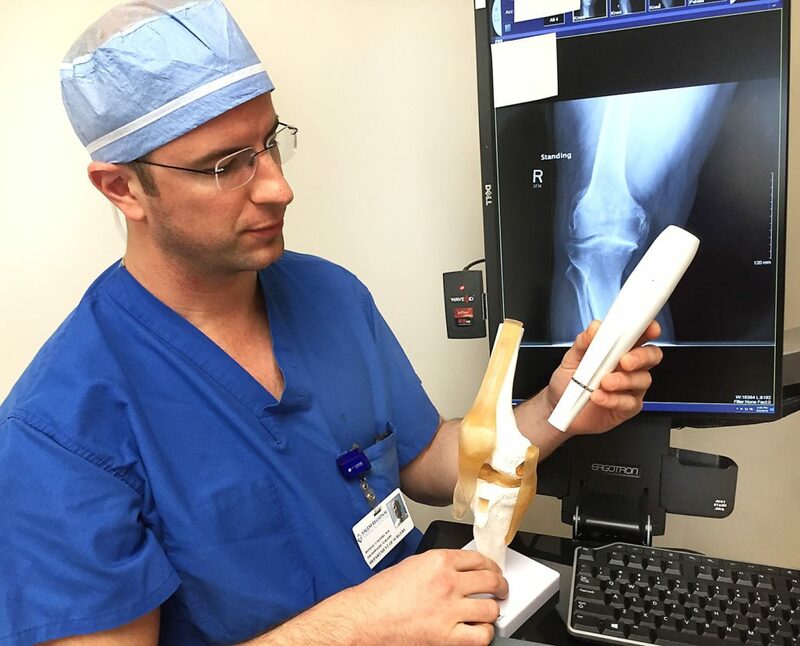 SALEM–More mobility, less pain, little to no narcotics — that’s what Dr. Dominic Peters is now offering his knee replacement patients at Salem Regional Medical Center. “I don’t like prescribing narcotics and I don’t like patients in pain,” Peters said during a recent interview about the iovera treatment. Iovera is basically a nerve-freezing procedure done seven to 14 days before surgery that temporarily numbs the nerve at the area where the surgical incision will be made. Peters, an orthopaedic surgeon with Salem Orthopaedic Surgery, described what happens like a subway train not completing its trip through a tunnel along its route. The wheels come off the train so it can’t go up or down the tunnel.The lack of wheels prevents the train from reaching its destination. In this case, the iovera handheld device uses three prongs on a smart tip to convert a small amount of nitrous oxide into an ice ball and injects it into the patient’s skin on the front of the knee. “It doesn’t kill the nerve, it just shocks the nerve,” he said. The effect is a temporary paralysis of the skin nerve to the knee, blocking the nerve from sending pain signals to the brain. The numbness lasts three or four months and gradually goes away as the nerve regenerates and starts feeling again. Peters is one of only a handful of doctors regularly using the procedure in Ohio. Peters serves in the orthopaedic center of the hospital, along with Dr. Lee Simon and Dr. Matt Noyes. Simon recently started using the procedure which Peters first used in January. Peters said he was able to test out the device first to see if it helped patients before making the purchase. Since then, he’s used the iovera treatment on 20 patients prior to knee replacement surgery. “They notice immediately. They’re having less pain after surgery, they’re more willing to bend (their knee). They’re taking less narcotics because they’re having less pain at the front of the knee where the incision is,” Peters said. Patients have a better range of motion after surgery, which makes physical therapy a little easier and could decrease the amount of therapy needed, although he said it’s going to be a little different for each patient. Normally, patients recovering from knee replacement surgery spend a couple days in the hospital, but that may be reduced to just a day depending on the patient. Physical therapy lasts four to six weeks. He noted that he’s just using it for knee replacements because of the skin nerve involved. He can’t use it for hips or shoulders because the nerves are really deep. The average age for knee replacement patients is 65, with the ages of patients ranging from 50 to 94. Patients are given the choice of whether to try the procedure, which Peters said is covered by Medicare and most insurances. The procedure takes 10 to 15 minutes in the doctor’s office. “There’s really no risk with it,” he said. Salem Orthopaedic Surgery can be reached at 330-332-7840.